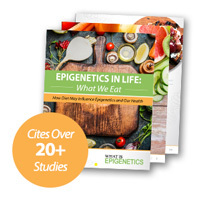 Eating Sweet, Fatty Foods During Pregnancy is Linked to ADHD in Children | What is Epigenetics? A high-fat, high-sugar diet during pregnancy could be connected to ADHD in children, suggests new research. A mother’s diet may adjust epigenetic marks that attach to her child’s DNA, potentially increasing the odds that he or she will develop ADHD. Attention-deficit/hyperactivity disorder, or ADHD, has become a prevalent condition in modern society as researchers attempt to explain its dramatic rise. As of 2011, around 6.4 million children ages 4 to 17 have been diagnosed with ADHD according to the CDC. It often occurs in tandem with early onset conduct problems in children, such as lying or fighting and, in previous studies, has been traced back to many factors like maternal distress or poor nutrition. In a study of over 160 children, researchers from King’s College London and the University of Bristol assessed mothers’ nutrition along with marks on their children’s DNA in order to identify associated epigenetic changes. Specifically, they looked at DNA methylation of IGF2, a gene linked to fetal development and development of certain areas of the brain associated with ADHD, namely, the cerebellum and hippocampus. They found that eating sweet and fatty foods during pregnancy was linked to higher DNA methylation of IGF2 in children who had early-onset conduct problems. Higher IGF2 DNA methylation at birth was able to predict ADHD symptoms in children between the ages of 7 and 13 who had early-onset conduct problems. “Our finding that poor prenatal nutrition was associated with higher IGF2 methylation highlights the critical importance of a healthy diet during pregnancy,” said Dr. Edward Barker from King’s College London. “A prenatal maternal high-fat and -sugar diet may alter the DNA methylation status of the IGF2 gene at birth, which in turn, may increase risk for a range of psychiatric and health disorders,” the researchers reported. Further studies will tease out the epigenetic effects of specific nutrients and food types eaten during pregnancy and determine whether they may be able to lessen the risk for diseases. For example, we know that omega-3 fatty acids, found in fish, nuts, and chicken, are crucial for proper neural development. It should be noted that there are many underlying causes of ADHD as well as many small influences all working together. Mothers of children with ADHD or other developmental disorders should not take from this study that they are the cause of their child’s condition. As a society, we should never use insights gained from epigenetic studies to blame mothers. However, the study does strengthen the message of the importance of proper prenatal nutrition. Source: Rijlaarsdam, J. et al. (2016). Prenatal unhealthy diet, insulin-like growth factor 2 gene (IGF2) methylation, and attention deficit hyperactivity disorder symptoms in youth with early-onset conduct problems. Journal of Child Psychology and Psychiatry, doi: 10.1111/jcpp.12589. Reference: Unhealthy diet during pregnancy could be linked to ADHD. King’s College London. 18 Aug 2016. Web.